After sorting through 7,000 images taken by photographers from over 150 countries, National Geographic has chosen the cream of the crop for it's annual photo contest. As always, the year's best are simply sensational. All photos and captions via National Geographic. I cannot describe the eery feeling I had when I walked in on this scene. I followed a massive storm front several 100 kilometers hoping to capture something special but this blew my mind. The surreal milky green water is a natural phenomenon caused by electomagnetic activity from the lightning hitting the waters surface. There was no rain where I was and not much wind either but in the distance the sky was charged and angry subjecting its wrath over the graveyard of dead trees in this normally very dry lake bed. I was able to capture a series of unique images this being one of the best. Réka Zsimon gets honorable mention in the nature category for this photo of Great Egrets taken in a tidal area of the Danube in Hungary. An Indian rhino, "far from home and stuck inside with late-winter blues at the Toronto zoo." 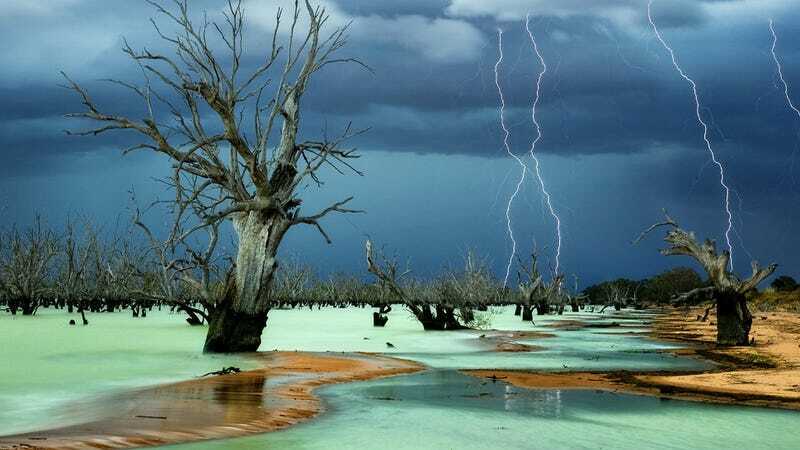 The photo won photographer Stephen De Lisle an honorable mention prize in the nature category. Realizing this old town (Laocheng, means old town in Chinese) would soon be transformed into a new town through the speedy economic growth in China and perhaps lose its raw beauty in no tome, I was pleased to capture this working mother carrying her child in her basket walking through the thick mist in a very early foggy morning, 2012. I was driving along the beach highway when i noticed the bulls sunbathing on the empty beach. I initially thought i was seeing things,but no it really was sunbathing cows !! I had to park my car a fair distance away and that meant a long walk along the beach in 35 degree heat. It did not matter because i had to get the shot ! When i got closer to them i was careful not to spook them so i crawled on my stomach on the hot sand to get a good picture of them. Mission Accomplished! It was worth the effort!